All four lanes of the M6 have been closed near Wigan after a lorry reportedly left the carriageway. 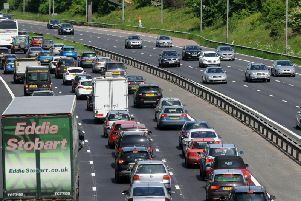 The incident happened on the M6 northbound between junctions J25 (Bryn) and J26 (Orrell) in Wigan at around 6.30am. Highways officers are advising that the stretch of M6 will remain closed until at least 10.30am. Police initially closed lane 1 to deal with the incident, but soon made the decision to close all four lanes. Ambulances are in attendance and accident investigation officers remain on scene. Highways England said the closure is due to an accident involving a lorry. Severe delays are expected on the M6 this morning after a serious incident in Wigan. Police and Highways are now taking traffic off at Junction 25 at Bryn in Wigan. The incident is causing severe congestion all the way to junction 26 near Newton-le-Willows and Warrington. According to Highways, there are currently delays of 40 minutes on the M6 approach to Wigan. The Southbound carriage remains open. Highways England said: "If this is you route please allow extra time. The closure is expected to remain in place for some time". Police are urging motorists to heed the matrix signs and follow the solid triangle diversion symbol on the approach to the incident scene.